As the electronics in the Canon ink cartridge and the printer communicate with each other, sometimes the printer will incorrectly identify an ink cartridge as empty or non-functional, and printing will not be allowed. 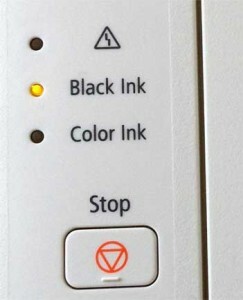 Typically, the printer’s Power/Ink level light will be blinking or an error message may be displayed (i.e. 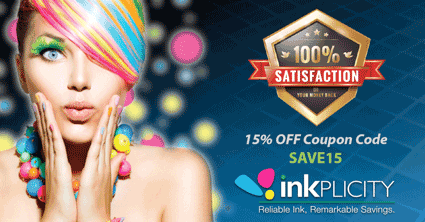 “Ink Has Run Out”) during the error condition. 1) Install cartridge and start print job. 2) After first message appears, click ‘OK’ to continue. Printer should start printing. 3) If second message appears and printer’s LCD screen displays error code “E”, then DO NOT click ‘CANCEL PRINTING’. 4) Press and hold down ‘Stop/Reset’ (or ‘Stop/Resume‘) button (triangle-circle icon) on your printer for 5-8 seconds until the ink low indicators turn off or printer LCD displays a “1” (select models). NOTE 1: On select MX/MG printer models you may need to hold two buttons down – not just the stop button. You will need to hold the COLOR button (or black button) AND the STOP button for 5-8 seconds to reset the ink level monitor/counter feature. NOTE 2: Following printer reset the ink low indicator may remain illuminated (steady, but not flashing) and you should still be able to print. If the respective indicator light continues to flash or displays an error code and printing is not permitted, then the cartridge may have suffered an internal electrical failure. If you still have an error condition which prohibits printing, then the ink cartridge may have internal electrical damage (micro-electronics failure); such a failure is unrelated to the ink cartridge refilling process and naturally occurs with time, use and age of ink cartridge. Typically, when the cartridge fails the problem is ‘masked’ by the ink out/empty condition so it can be difficult to distinguish between the two. NOTE 3: A compatible ink cartridge can be problematic when installed into the printer following refilling. Compatible cartridges are typically purchased on-line or at select retailers (i.e sold under a different label than the regular Canon cartridge packaging) and is essentially a “knock-off cartridge” of the Canon original/genuine ink cartridge. For the best refilling experience, only use Canon original/genuine or remanufactured Canon ink cartridges. NOTE 4: All cartridges being repeatedly refilled eventually do fail. Some cartridges/printers may encounter an unavoidable mechanical or electrical failure which is unrelated to refilling. Check for physical damage on the cartridge. Look at the print cartridge and see if there are any cracks, tears or missing elements. Any one of these can cause a failure. In these cases, you will need to purchase a new cartridge and start the refill process again after it has run out.